The August Smart Lock AUG-HK is part of the Door lock test program at Consumer Reports. In our lab tests, Door lock models like the Smart Lock AUG-HK are rated on multiple criteria, such as those listed below. Kick-in as sold: Resistance to kick-in as sold is how well the lock survived increasingly forceful impacts using the hardware it comes with. Kick-in reinforced: Kick-in reinforced is the same test using an aftermarket Box Strike in place of the included strike or, for surface-mount locks, 3-inch screws; models scoring Excellent as sold were not retested. Drilling: Drilling shows how well the lock stood up to assaults with a drill. Keyless lock Keyless lock Lock only has a keypad - no physical key. Auto lock/unlock Auto lock/unlock Automatically re-locks your door shortly after you unlock it. This feature can also automatically unlock your lock when you arrive home. Electronic keys Electronic keys An access code can be sent by phone, email or through an app that will allow the user to unlock the door. Access log Access log Allows the user to review who has used the lock and when. 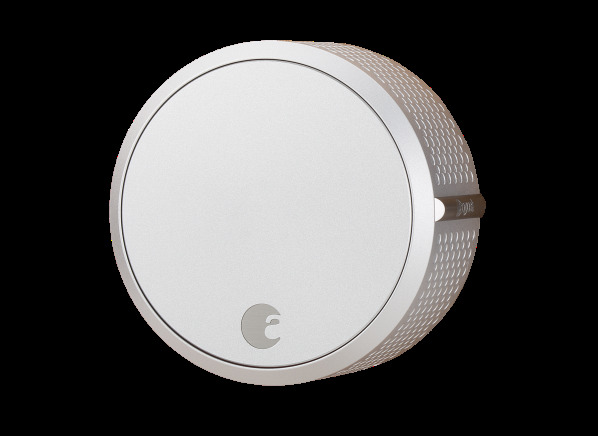 Tamper alarm Tamper alarm An alarm will sound if someone is tampering with the lock. Geofencing Geofencing The auto unlock feat automatically unlocks your lock when you arrive home based on your location.